A Trademark distinguishes your goods or services from another same line business or your competitors and can take many forms; for example words, slogans, logos, shapes, colours and sounds. By trademark registration, you own legal right to use the Brand name or Logo and can put restriction on others from using the same. Trademark is registered for specific goods or services within individual subjects, known as classes. This should not be descriptive and must not include common surnames, geographical names, registered company names or anything implying royal patronage. It is possible for others to register identical or similar marks as long as it is in a different, unconnected class. There are total 45 classes to choose for Trademark as per your activities. A Trademark can be registered under more than one class separate application for each class. Which benefits you to secure your brand name through all relevant classes. TM can be use from the date of filing of the application with authority. Trademark Authority generally takes approx. one and half year to issue certificate and since the date of certification you become legal owner of the Trademark of your brand name and use ® symbol with your brand name. A Govt. Registered Trademark Agent can File application for Trademark ONLINE and it is speedy process and cost effective and save Rs 1000 less Govt. fee. In all other cases, Applicant or Authorised Representative or Consultant normally file OFFLINE by visiting Department. BUT, it is suggestible to Get Registration Only from Authorised Govt. Agent. We’re Govt. Registered Trademark Agent in India. Trademark registration will help establish a unique identity and brand for your goods or services. Competitors will not be allowed to use your trademark for similar goods or services. Registered Trade Name helps to build your Goodwill and creates Trust among customers as it brings uniqueness to your product. Registered trademark name is available in government trademark database and easily searchable . Consequently it helps you to get popular among people. above fees includes govt fee of Rs 4500/9000. Once Application drafting completed, Next step to submit. Once authority approved the application, A Registration CErtificate is issued. This Complete process takes approx one year. First, Get Consultation from our Trademark Consultant / Trademark Agent to know the eligibility requirements, documents and process of registration. Before filing application, we search availability of proposed Trademark and make ensure proposed trademark is not similar or identical to an existing registered trademark. Accordingly we suggest client. Next step we file Application online and pay Govt. fees and get the Acknowledgement immediately. We Track the application status and update Client time to time. Once authority accepts the Application and all formalities completed by authority and applicant, Registration Certificate is Issued. How to check Trademark Application Status online? Open IPR Website https://ipindiaonline.gov.in is TradeMark Registrar Website in India. Find Status You can find there status report online along with all submission details and from there you can download all submitted files. The mark 'TM' is just an indication that you are using the mark or the name as your trade name of the product. To protect the interest and claim the prior use in Trade Mark, generally people in India using 'TM' from the date of filing an application for the registration of Trademark till its registration. Trade Mark Act, 1999 does not provide any provision for using 'TM'. But American Trade Mark Laws do provide for the same. It is suggestible to use 'TM' to establish your prior right over the product trade name. 'SM' stands for Service Mark. Service marks are marks that represent services. So for example, I’m XYZ Legal Firm. I offer legal services. It’s a service mark. Whereas the mark '(R)' indicates the general public that the trade name / mark you are using is a registered trademark. Usage of '(R)' for unregistered trademarks is a criminal offence. Class 1 : Chemicals which are used in industry, photography, forestry, unprocessed artificial resins, Tanning and adhesive substances etc. Class 2: Paintings, coals & pigmentation, lacquers, mordants, printing, and art etc. Class 3 : Cleaning products, cosmetics, bleach and abrasives, laundry products, essential oils etc. Class 4 : Fuels, industrial oil, greases, illuminates, wetting and binding compositions, fuels, wicks etc. Class 5 : Pharmaceuticals, veterinary products, dietetic, dental wax, disinfectants, herbicides, fungicides etc. Class 6 : Metal castings, hardware, locks and safes, common metal and their alloys, building material (metal), other metals are not included in any other class etc. Class 7 : Machine and machine parts (except for land vehicles), incubators for eggs etc. Class 8 : Implements and hand tools, cutlery and razors etc. Class 9 : Cash registers, calculating machines and data processing equipment, teaching apparatus, magnetic data carriers, etc. Class 10 : Surgical, medical and dental apparatus, artificial limbs, eyes teeth etc. Class 11 : Apparatus for heating, lighting, steam generating, cooking, refrigerating, dying etc. Class 13 : Ammunition, firearms, explosives, fireworks etc. Class 14 : Precious metal and their alloys, products in precious metals, jewellery etc. Class 16 : Cardboard, paper, and goods made from these materials, print matter, bookbinding, paint brushes, playing cards, printing blocks etc. Class 17 : Rubber, gum, asbestos, mica, and goods made from these materials and not included in other classes. Class 18 : Leather and imitations of leather, and articles which are made from these items and not included in other classes, animal skins, and hides etc. Class 19 : Non–metallic rigid pipes for buildings, asphalt, pitch, and bitumen etc. Class 20 : Picture frames, mirrors, Furniture of wood, cork, reed, cane and not included in any other category. Class 21 : Household and kitchen utensils, brush making material, articles for cleaning purposes etc. Class 22 : Nets, ropes, strings, sails, sacks and bags and fibrous textile materials etc. Class 23 : Threads and Yarns for uses in textiles. Class 24 : Textile and textile goods which are not included in the other classes. Class 25 : Clothing, footwear, and headgear. Class 29 : Poultry items, Meat, jams, eggs etc oils and edible oils. Class 30 : Coffee, tea, sugar, cocoa, rice, tapioca, spices etc. Class 31 : Horticulture, agriculture and forestry grains which are not included in any other class. Fresh fruits and vegetable, seeds, malt etc. Class 32 : Aerated drinks, beer, non-alcoholic drinks (including juices and fruits drinks) and other things which are used for preparing beverages. Class 36 : Financial and Insurance Services. In this class, activities relating to insurance, finance sector or the monetary sector are included. Class 37 : Building Construction and Repairs. In this class, the work done by contractors, sub contractors, in the making or repairing work of buildings, or any restoration of work to its original state is included. Class 38 : Telecommunications. In this class, services which help in communicating anything between people is covered, whether oral or visual. Class 40 : Class 40: Treatment of Materials. In this class, any service which involves changing of a chemical or the mechanical composition of a substance is included. Or any other service not included in any other class on the same lines. Class 41 : Education and Entertainment. In this class, any service which improves the knowledge or mental capacity of a person or animal is included. It also includes services which entertain people or animals. Why do you need FinTaxx Corporate Professional's service ? It is important your Application is filed correctly and properly as per legal requirement. Our Experts are well experienced in this line to get your work done smoothly. How to select a good trademark? If it is a word it should be easy to speak, spell and remember. The best trademarks are invented words or coined words or unique geometrical designs. Please avoid selection of a geographical name, common personal name or surname. No one can have monopoly right on it. It is advisable to conduct a market survey to ascertain if same/similar mark is used in market. What is the function of a trademark? 1) It identifies the goods / or services and its origin. 2) It guarantees its unchanged quality. 3) It advertises the goods/services. 4) It creates an image for the goods/ services. What are different types of trademarks that may be registered in India? # Any name (including personal or surname of the applicant or predecessor in business or the signature of the person), which is not unusual for trade to adopt as a mark. # An invented word or any arbitrary dictionary word or words, not being directly descriptive of the character or quality of the goods/service. # Letters or numerals or any combination thereof. # The right to proprietorship of a trademark may be acquired by either registration under the Act or by use in relation to particular goods or service. # Marks constituting a 3- dimensional sign. # Sound marks when represented in conventional notation or described in words by being graphically represented. Can any correction be made in the application or register? Yes. But the basic principle is that the trademark applied for should not be substantially altered affecting its identity. Subject to this changes are permissible according to rules detailed in the subordinate legislation. Can a registered trademark be removed from the register? It can be removed on application to the Registrar on prescribed form on the ground that the mark is wrongly remaining on the register. The Registrar also can suo moto issue Notice for removal of a registered trademark? How to withdraw trademark application? What is the validity of the Trademark? Trademark Registration Valid for 10 Years and Renewable in every 10 years by paying fee. Who can apply for a Trademark? An individual in his own name. A joint owners in the name of both the owners. Both the parties are considered as trademark owner. A proprietorship firm, the proprietor can apply for a trademark in his own name. A partnership, the name of all the partners is required to mention in the trademark application. A Limited Liability Partnership, the trademark application must be made in the LLP name. An Indian company, the application must be made in the name of the company only. An Foreign company, the application must be made in the name of the company only. A Trust or Society. If a trademark application is made on behalf of a Trust or Society, the name of the Managing Trustee or Chairman or Secretary representing the Trust or Society should be mentioned. Is a trademark registered in India valid in foreign countries? A trademark registered in India is valid only in the home country, i.e. India because every country has its own rules and regulations of the trademark. You can register the trademark in foreign countries through Madrid Protocol, and the trademark registration India serves as the basic mark for the international trademark registration. Is there any physical meeting required with FinTaxx Consultant to get the Trademark registered? NO. There is no requirement for any physical meeting. We collect all documents online and file with authority same day we get the documents on Email. A Trademark need to get registered under a class. there are 45 classes of Goods/Services. Your have to select the appropriate class according products and activities. What are the Classes of Trademark registration? The manufacture of goods and services are grouped into different classes. Total Class is 45. Each class requires a different registration. This is a classification of almost 80,000 products and services. What is Government fees for Trademark Registration application? What is the difference between Trademark, Copyright and Patent? Trademark, copyright and patent are the types of intellectual property in India. Although all types of intellectual property are very different, but people often get confuse among them. Trademark A Trademark distinguishes your goods or services from another same line business or your competitors and can take many forms; for example words, slogans, logos, shapes, colours and sounds. By trademark registration, you own legal right to use the Brand name or Logo and can put restriction on others from using the same. Copyright is a protection extended to original work of authorship; the scope includes musical, literary, artistic work either published or unpublished. Patent is a grant of an exclusive right to the inventor to protect their invention for a limited time duration. 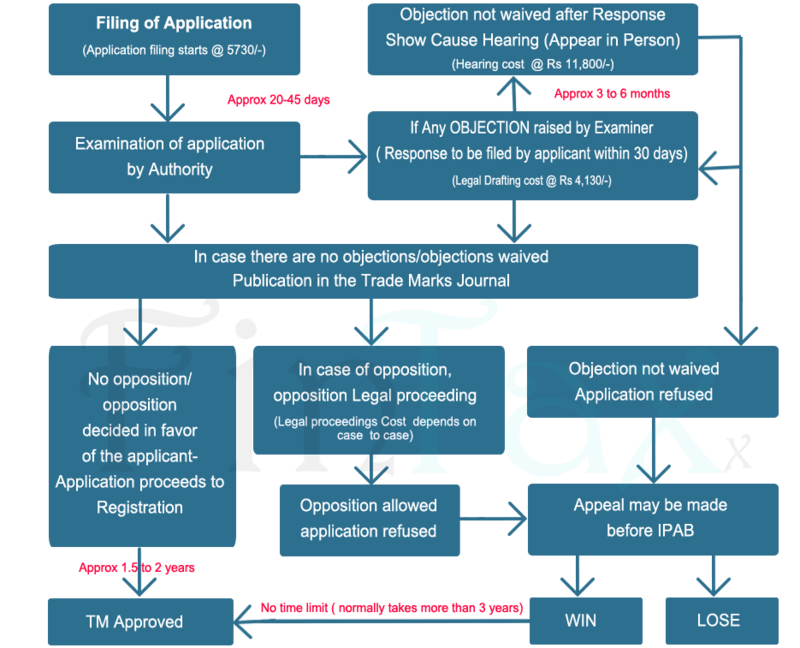 What are the Trademark Registration process after filing Application? => The Examiner will scrutinize the application for any deficiencies. => The applicant should within one month of the communication in this regard, remedy the same. => The content of statement of case is assessed by a consultative group of experts will versed on the subject. => The will ascertain the correctness of particulars furnished. => Thereafter an Examination Report would be issued. => If the Registrar has any objection to the application, he will communicate such objection. => The applicant must respond within two months or apply for a hearing. => The decision will be duly communicated. If the applicant wishes to appeal, he may within one month make a request. => The Registrar is also empowered to withdraw an application, if it is accepted in error, after giving on opportunity of being heard. Every application, within three moths of acceptance shall be published in the Geographical Indications Journal. => Any person can file a notice of opposition within three months (extendable by another month on request which has to be filed before three months) opposing the GI application published in the Journal. => The registrar shall serve a copy of the notice on the applicant. => Within two months the applicant shall sent a copy of the counter statement. => If he does not do this be shall be deemed to have abandoned his application. Where the counter-statement has been filed, the registrar shall serve a copy on the person giving the notice of opposition. => Thereafter, both sides will lead their respective evidences by way of affidavit and supporting documents. => A date for hearing of the case will be fixed thereafter. => Where an application for a GI has been accepted, the registrar shall register the geographical indication. If registered the date of filing of the application shall be deemed to be the date of registration. => The registrar shall issue to the applicant a certificate with the seal of the Geographical indications registry. A registered GI shall be valid for 10 years and can be renewed on payment of renewal fee. Additional protection for notified goods is provided in the Act. What Indications are not registrable ? > which although literally true as to the territory region or locality in > which the goods originate, but falsely represent to the persons that the goods originate in another territory, region or locality as the case may be. Explanation 1 to section 9 says that for the purposes of this section, “generic names of indications” in relation to goods which although relates to the place of the region where the goods was originally produced or manufactured, has lost its original meaning and has become the common name of such goods and serves as a designation for an indication of the kind, nature, type of other property or characteristic of the goods. > An application may be made to the registrar in respect of goods notified by the central Government for additional protection for a registered geographical indication in Form GI-9 accompanied in triplicate along with a statement of case and shall be accompanied with the copy of the notification issued. > The application shall be made jointly by the registered proprietor of the Geographical indications in India and by all the producers of the Geographical indication. > The Affidavits required by the Act and the rules to be filed at the Geographical indications Registry or furnished to the Registrar, unless otherwise provided in the matter or matters to which they relate, paragraphs consecutively numbered, and each paragraph shall as far as practicable be confined to one subject. Every affidavit shall state the description and the true place of abode of the person filing it and shall state on whose behalf it is filed. ii) in any country or place outside India before a diplomatic or consular Officers (Oaths and Fee) Act, 1948, or such country or place, or before a notary public or before a judge or magistrate of the country or place. > Where the deponent is illiterate blind or unacquainted with the language in which the affidavit is written a certificate by the person taking the affidavit that the affidavit has read translated or explained in his presence to the deponent made his signature or mark in his presence shall appear in the jurat. > Every affidavit filed before the Registrar in connection with any of the proceedings under the Act or the rules shall be duly stamped under the law for the time being in force. > The documents mentioned in sub-section (1) of section 78 shall be available for inspection at the Head Office of the Geographical indications registry. > A copy of the register and such of the other documents mentioned in section 78, as the Central Government may by inspection at each branch office of the Geographical Indications > Registry as and when established. > The inspection shall be an payment of the prescribed free and at such times on all the days on which the offices of the Geographical Indications Registry are not closed to the public as may be fixed by the registrar. > Distribution of copies of journal and other documents. The Central Government may direct the Registrar to distribute the necessary to such places as may be fixed by the Central Government in consultation with the State Government and notified form time to time in the Official Gazette.